Tapenade is a popular dish in France, It can be used as a spread or as a topping for baguettes, crackers, or even you can use this as a stuffing too. We first tasted this when we were in Singapore. We used to get this in carrefour and Market place. As we all like tomato and olives we started loving this and I started making at home which is so easy, tasty and fresh then store bought one. For past 4 years I am making this and my fridge will always be filled with atleast 2 kinds of spread, as we eat sandwiches for breakfast at least 250 days a year. 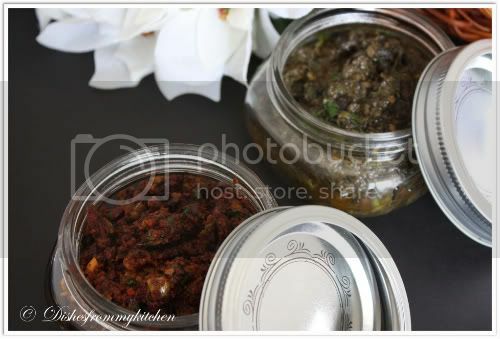 I usually make 2 types Olive which is my sons favorite and Sun-dried tomato Tapenade. The key ingredient in these are Olive oil, Herbs, Olives and Capers. I am sure you all will love too if you are Olive lovers.. Just give it a try if you never tried it. I usually make it with slight Indian touch by adding chilli powder to the Tomato tapenade to make it more spicy, Its up to you can can either add chilli powder or Pepper powder. 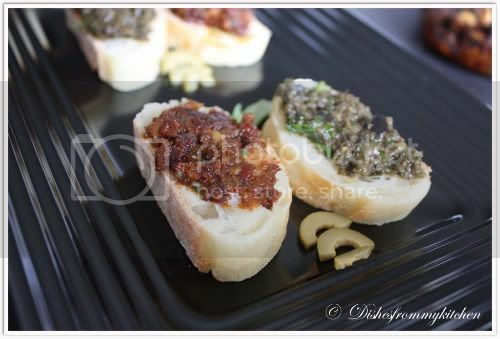 Take a glance at the tips to see the use of Tapenade for making other dishes. Salt as required as both Olive and capers has salt in it. 1. Add all the above in the food processor or mixer and give it a whip. 2. Just make a coarse paste and store in the air tight container. 1. Put all the ingredients in the food processor or mixer and make it coarse paste. 2. Save it in the air tight container. 1. Make sure to use good quality olives which gives wonderful taste. 2. The herbs has to be washed and dried using the paper towel as we can store this for at least 10 days in the fridge. 3. If your not having the Sun-dried tomato which is not soaked in the oil then do this procedure. Just warm the olive oil now put the dried ones and herbs let it soak for 1 day or so. Then you can use this for making tapenade. 4. Other than Tomato, olives, capers and Oil all other ingredients are optional add according to your taste. 1. You can add a spoon of Tomato Tapenade to the egg mixture when you make omelette's, tastes so so good. 2. You can stuff the tapenades in the Mushroom and add your favorite cheese and grill or bake in the oven. 3. Topping for the french baguettes, Crackers and breads. 4. Saute 2 tbsp while making Tomato or Olive pasta. Wonderful Spread..I too love eating Sandwich with these spread every Morning! Awesome!!! 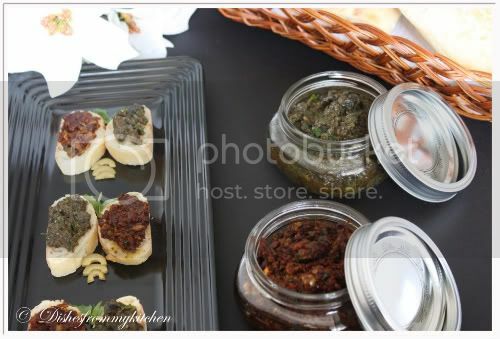 This is new to me..
Dips look so inviting...would love to try it sometime...very nice pavithra, thanks for sharing. It has been a long time I visited here. Your recipes seem delicious as before. never heard of this french dish. Looks nice. Hope the journey ends. I really miss my mother and her food. I will bookmark all these recipes so I can refer them at the end of the journey. The Dips look very tasty and delicious. The clicks make them appear so close to us that I can almost touch them.Great preparation. Very interesting recipe, as usual...simply adore ur pictures there, they make me drool:) I never heard abt this dish, thanks for sharing. Incredible pics ,makes me so hungry and learn a new thing from you thanks! Lovely recipe dear. Bookmarking it. Very nice recipe..thinking of carrying the basic ingredients from here when I go home and will try. I usually pass on the store brand tapenades because they mostly have anchovies in them. I am glad to see this recipe without it. tapenades looks very cute and colourful...nice click too! The recipe sounds simple n yummy.....I have everything other than capers...wondering whether I can prepare without it? They look gorgeous! Man..you're blog is a busy place - I just saw your post in my feed and there are already 27 comments! Love the recipe - will try sometime! Wow this looks amazing ...new to me ..want to taste it right now...Asusual nicely presented dear .. This is new to me .Sounds interesting and looks yummy! such a beautiful dish. My son would love this. Beautiful clicks. What delicious tapenades! I love the tomato one! Its totally new to me and the picture looks perfect. A great evening munch. Spreads looks fantastic Pavitra ! 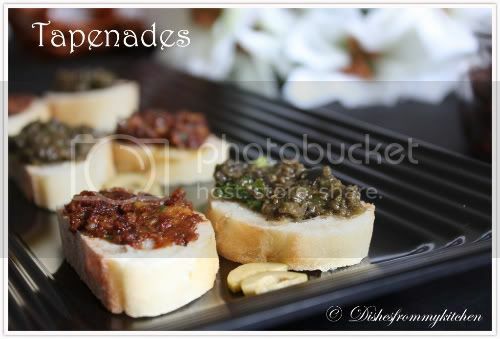 Both tapenades look and sound really tasty - great photos. wow wonderful spreads.. Looks tempting..
Looks like a great spread! I am so making this!! first time on your space...so unique...will be back soon! 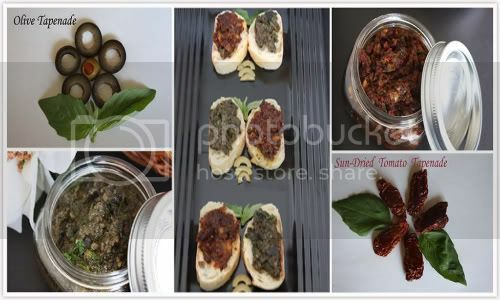 Am an addict to olive tapenades, tomato tapenades looks great...feel like grabbing few from the clicks..
hey love the recipe of the tapenades..very handy ingredients..delicious and tasty..
You are really an artist. Very attractive. Keep it up. Love to follow you. hi pavitra, thanks for your comment, I am so forgetfull, I don't know if this is my first time, these Tapenades look very good with olives which was what very interesting to me, I will give this a try! !, they look fantastic and lovely clicks too., you have a lovely blog too..
Thx for sharing this dear!!! Tapenades looks very tempting . Both tapenades looks great..thanx for sharing..in U.K very expensive.. The Tapenades look good! Simple to prepare but delicious! What a lovely dish. Absolutely new and interesting recipe. Looks delicious and tempting. 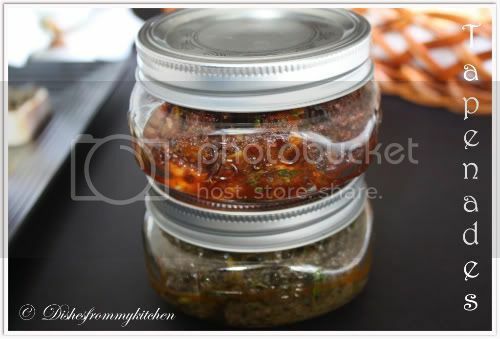 Tapenade looks fabu!I would have tasted it if u ar in LA ...missing all ur dishes.how can u get such diff ideas ?? Lovely papenade.Beautiful clicks too.My first time here.I like your collection of recipes. Looks tempting and yummy btw i liked the rect black plate. These are just lovely! Thanks for sharing the recipe! First time here. You have awesome collections.